You only need just a couple of ingredients: some bread/baguette for the crostini, gorgonzola or any other fragrant blue cheese, fresh fruit (I used peaches and blueberries but you can even put pear slices or any other berries (raspberries, blueberries, etc.) on the crostini), some crushed hazelnuts or hemp seeds for some crunch and a drizzle of honey to sweeten things up and voilá, the delicious fancy crostini are ready to be devooured! Place the toasted crostini on a plate or cutting board and let it cool slightly. Once the crostini aren't hot anymore spread some gorgonzola on them. 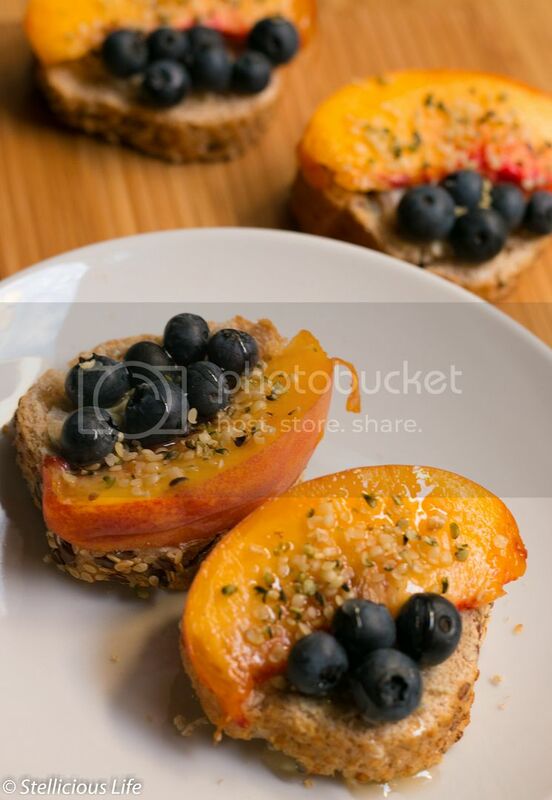 Top with sliced peaches and the blueberries, sprinkle with the crushed hazelnuts or hemp seeds and drizzle with honey. It's ready, enjoy! 1. If you want to toast your crostini in the oven, preheat your oven to 400 F and place the baguette slices on a baking sheet lined with parchment paper. Bake for about 10 minutes (depending on your oven it may take more or less, check so they don't burn), until toasted and golden brown. 2. These crostini are very versatile, you can mix and match the fruits you use: pears, grapes and walnuts go very well with gorgonzola, but you can get creative and try some other combinations as well. Peaches and blueberries are so good together! Love that you put them on crostini! Looks delicious! Don’t you just love how crunchy crostini are? And yes, this combination was indeed delicious 🙂 Thanks Ashley for stopping by! Love this combo – peaches and blueberries go so well together, and I especially love the crushed hazelnuts on top. Too good! mmmm, anything with cheese and bread is definitely my kind of snack. Love the addition of peaches and blueberries to change it up! Oh yes Beverley, and the crushed hazelnut/hemp seeds are really great on top for some crunch. I love how simple, yet full of yummy flavor these are! These look amazing and I love the combination of the cheese and sweet fruits. It really is the smartest snack I can think of. Reading about your munchies while waiting for dinner reminds me of myself, but this is a great treat. These look so appetizing! Fruit, cheese, and bread – what could be a better combination? Try them Marie, they are so simple and easy and yet they taste so fancy and special! This is such a great idea, this would be beautiful for entertaining. My thoughts exactly Sara! Since they look and taste so fancy but come together in no time, they could be a great solution when uninvited guests come. I am LOVING the flavour combo you have going on here! This sounds so delicious! Thank you Amanda, they were sooo good! Teresa you could make them with pears or apple slices as well. Personally I would love to try it with figs as I think it would go really well with the gorgonzola. These would be great as an after school snack! Nice job, pairing flavors with this crostini; all of these toppings are wonderful friends! Thank you, yes they go together really well, but I love how the possibilities can make these crostini really different and varied depending on the fruits and nuts you choose to use. Very unusual recipe. I actually have some spare peaches so we might give it a try tomorrow. These look so good1 I love the combination of peach and blueberries together!